V for Vendetta by Alan Moore (2012, Mixed Media). Condition is Brand New. Shipped with USPS Priority Mail. Mask and Trade Paperback included! Please message me with any questions!! A graphic novel that defined sophisticated storytelling. It includes the famed V mask in PVC with white elastic band, and is presented in a window box. In a world without political freedom, personal freedom and precious little faith in anything comes a mysterious man in a white porcelain mask who fights political oppressors through terrorism and seemingly absurd acts. It's a gripping tale of the blurred lines between ideological good and evil.The inspiration for the hit 2005 movie starring Natalie Portman and Hugo Weaving, this amazing graphic novel is packaged with a collectable reproduction of the iconic "V" mask. 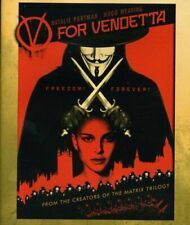 item 3 V for Vendetta Deluxe Collector Set [With Mask] by David Lloyd. -V for Vendetta Deluxe Collector Set [With Mask] by David Lloyd. Story was good well packaged. Mask wasn't much more than flimsy plastic but still nice.